Enhance the flavour of your baked salmon with our homemade balsamic glaze. 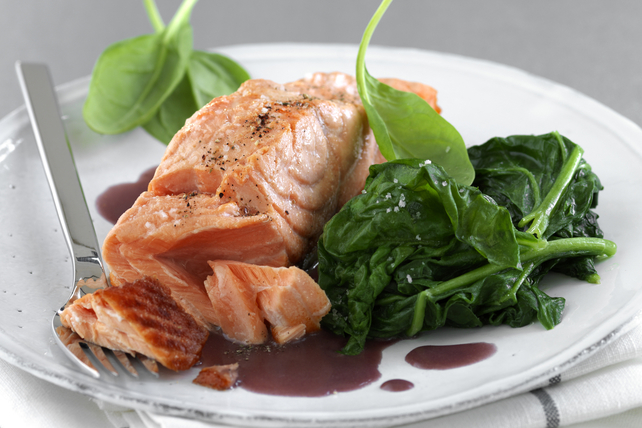 This Baked Salmon with Spinach features the perfect blend of sweet and zesty flavours. Mix first 4 ingredients until blended. Place fish in single layer in 13x9-inch pan sprayed with cooking spray; drizzle with half the dressing mixture. Turn to evenly coat both sides of fish fillets with dressing mixture. Bake 10 min. Remove pan from oven. Move fish to one side of pan. Add spinach to other side of pan; drizzle with remaining dressing mixture. Bake 3 to 5 min. or until fish flakes easily with fork. Garnish our Baked Salmon with Spinach with chopped fresh chives or green onions before serving. Substitute red snapper fillets for the salmon fillets in this easy-to-make Baked Salmon with Spinach recipe.